Before I get into summarizing individual sessions, a few observations are in order. Overall, I think the conference has been well organized and produced. They have put a lot of money into the event, everyone feels comfortable, panelists are generally well chosen, and the topics are fairly diverse and interesting. If I had any criticisms, my main concern would be that the conference seems to be unclear about defining its purpose. Its slogan (which I dislike due to its redundancy, despite the fact that I understand it) is “Tourism in a Global World.” And many of the panels focus on just this topic. But at the same time, a number of the speakers have focused specifically on publicizing Israel and Jerusalem, almost “pitching” it to the global tourism community. Clearly, promoting Jerusalem and Israel is the underlying purpose for running an event of this nature here and now. But I believe that simply holding the event here accomplishes that goal by itself. The blatant promotion seems a bit out of place when the slogan is about globalism in the tourist industry. I wonder if overseas visitors will feel they have been given a product that differs from what was promised by the conference’s tag line. The night began with heavy security, due to the appearance of the Prime Minister. As much as I am used to security in Israel, it did seem a drop heavy-handed on Tuesday night. This seemed to be what some of the panelists the following day were referencing when they said you need to walk the fine line between providing enough security so tourists feel safe and providing so much that it becomes obtrusive and annoying. Once inside, we found a lovely reception with delicious food and open bar. Once everyone had gotten inside, everyone filed into the main hall, seating themselves at tables — a nice touch that made it feel less like a traditional conference and more like an awards ceremony. Setting the tone right away, the event opened with a short video that stressed how technology and the Internet are bringing us all closer together. (For anyone reading this who is on Twitter, a couple of us have used the hashtag #ITCJeru for tweets on the subject.) 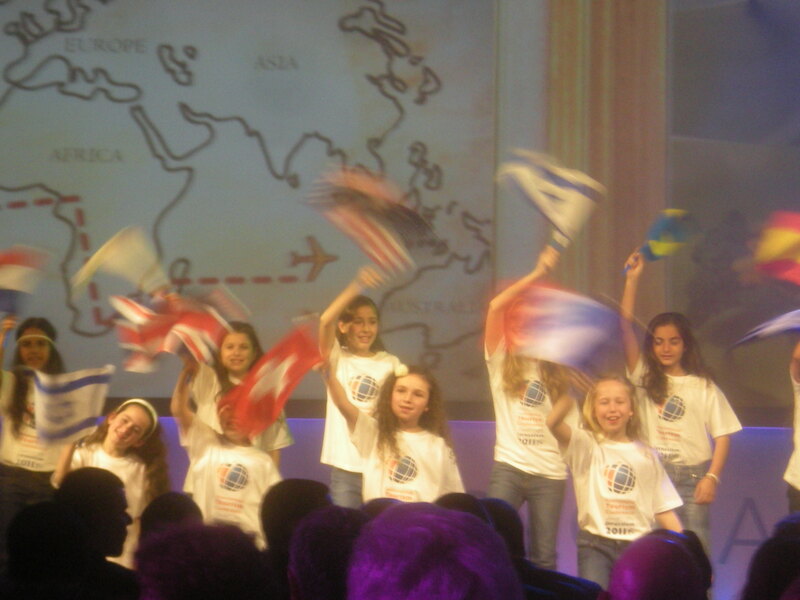 This was followed by a cute performance by a group of little girls singing “It’s a Small World” translated into Hebrew. Bibi (as Netanyahu is popularly known) spoke in English and described both why we need tourists to come here and what we have to offer to the global tourist community. Despite record tourist numbers last year, he said it is still not enough. 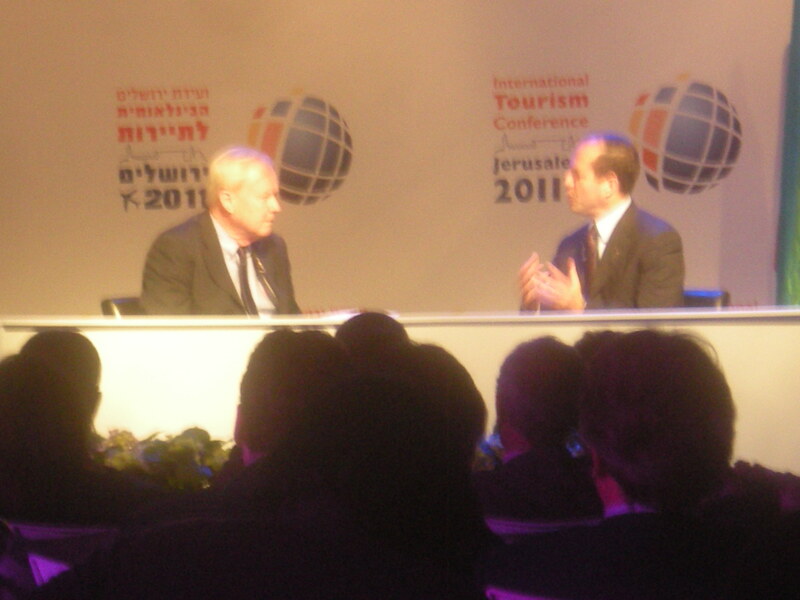 “Israel should have more tourists than people,” he said, stressing that instead of a 1:2 ratio of tourists to people, we need more of a 1:1 ratio. He stressed the high-tech nature of our economy, and the unique cultural and religious offerings available here. Israel is the only place on Earth, he said, where “if you place a call to God it is a local call.” It is a real “Bible Land” in contrast to those pitched by American televangelists. We were sitting, he pointed out, about 400 meters from the birthplace of John the Baptist, in the nearby Ein Karem neighborhood. Focusing on the Christian market, he said that to drive tourism to the Christian sites in the Galilee we should have direct flights there, though it was unclear how he meant this, since there are no plans (to my knowledge) to build another airport there at the moment! 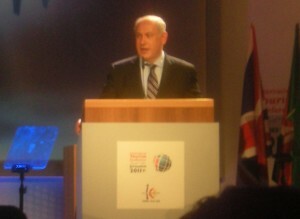 Until recently, Netanyahu continued, he would have told you to go to Tel Aviv to see how fun a country we are as well. While many European cities are shutting down by 11 or 12 at night, Tel Aviv doesn’t even get going until 2 or 3 AM. “Until recently,” he pointed out, because now you can find the same thing in Jerusalem. Barkat then responded to Matthews’ questions about how to attract tourists to Jerusalem in a climate of tension. He began by saying that the fact is that Jerusalem is actually a very safe city. People want to come here and we need to make their stay pleasant to turn them into “cultural ambassadors.” Jerusalem is not just for its residents, he said, stressing his desire to turn it into an “international open city” for the world to enjoy. More than once he said the city must “fanatically maintain freedom of religion” for all, allowing everyone to enjoy any part of Jerusalem in their own way, with respect. Other speakers included Ambassador Dr. Zoltan Somogyi of the World Tourism Organization, Moshe Lion of the Jerusalem Development Authority and Ami Federman of the Israeli Hotels Association and Dan Hotel chain. But the other highlight of the evening for me was a warm and enjoyable speech by Roedy. He spoke fondly of Harel saying that she is still his favorite veejay from her days on MTV Europe. He was born within a month of the birth of the State of Israel, in June 1948 and made his first visit here after the 1973 Yom Kippur War. Coming out of the Vietnam War, he looked on Israel as a “beacon of democracy.” And while his friends celebrated the U.S. Bicentennial in 1976, he was more riveted by the famous hostage rescue at Entebbe. He has traveled literally all over the world, and when people ask his favorite place, Roedy has a list of his top 25 cities that he tells them. But he said that while some may shift, his #1 city always remains the same: Jerusalem. “Jerusalem is a source of cool,” he said. Finally, however, he stressed the need to connect with young travelers. They are less affected, he said, by political turmoil and bad press. Through significant market research, he said he found that young people say their second most fulfilling experience was encountering new cultures through travel. Their most prized competition win was a holiday, which was also the main place they spend their money. And 8 of 10 said they would travel for a festival or music event. Roedy also showed some videos stressing an MTV Travel campaign that brought a high profile to tourism in Estonia and in Malta. All I could think was when will Roedy bring one of these festivals to the country he says he loves so much: Israel? My next post on the Conference will cover the first full day of panels, Wednesday. I’ll post a separate entry on the final day and its panels. Love your blog fun Joel! Thanks! Did you pass the exam, by the way? There was a free bar!!! I should have gone. This is a good blog man, I demand more posts!